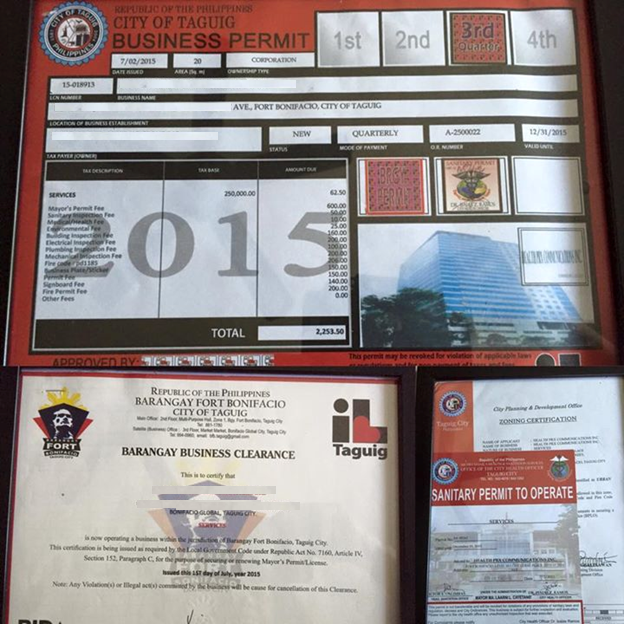 Compare business permit taxes for small companies in Makati vs. Taguig. In Makati (I took these photos sometime in April 2015), Barangay + City taxes and fees = P1,900 + P23,785 = P25,685. In Taguig, posted by friend in facebook last July 2015 after she registered her new company. I covered the name of her firm. 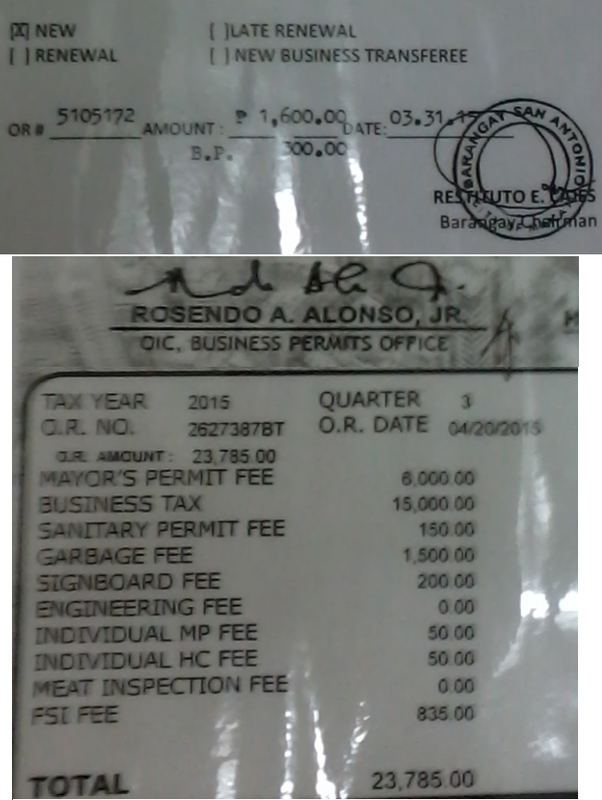 City hall taxes and fees = P2,253. Only 1/10 of what Makati City hall collects, wow. Among the reasons why many business locators in Taguig Fort Bonifacio do not want Makati City Hall to have power over them. Taxes and fees are a lot higher. Meanwhile, I wrote this on August 04, 2011. A friend asked me about my thoughts on whether there should be more fragmentation or more consolidation of local government units (LGUs) in the Philippines. Being an advocate of less government, more personal responsibility and free market, my quick answer is more consolidation of LGUs, not the creation of new ones. But before expanding further, here is a rundown of the number of LGUs in the country. I don't remember the source of those numbers. I checked with DBM's Budget of Expenditures and Sources of Financing 2012, LGUs section, I counted 80 provinces and 122 cities. I also learned that only Pateros remains a municipality in Metro Manila, the 16 other LGUs are now cities. I once discussed with my Indonesian friend my idea that with more than 21,000 islands and islets (vs. the Philippines' 7,100+) covering 4 time zones, Indonesia should break up into several countries and republics in order to spare the far away provinces and islands from the bureaucratism of the central government in Jakarta. He reminded me that despite its size, Indonesia has only 33 provinces vs. the Philippines' 80. Good point there. Many politicians tend to view an LGU as a "mini-republic". A Congressman who finishes his 3-terms limit (3 years per term) and cannot fight another candidate for Governor with a good chance of winning, and does not want to run for Mayor of any of the cities or municipalities, would tend to propose the creation of a new province in an existing province so that he can run there as a provincial Governor with a good chance of victory. At some point, this is one reason why the number of provinces nationwide has expanded. To create a new LGU, say a new province out of an existing big province, or a new city out of an existing big city, would mean doubling the number of local government officials (elected and appointed) and other lower-level personnel. The Union of Local Authorities of the Philippines (ULAP) boasted sometime in 2006 that they have 1.7 million membership nationwide. The Civil Service Commission (CSC) at that time said there were only 400,000+ LGU personnel nationwide. I think the ULAP figure included personnel down to the barangay level while the CSC figure did not include barangay personnel, as well as temporary or contractual personnel in municipalities, cities and provinces, vut I'm not sure of these. A friend of mine who was an HR official of the Paranaque City Hall once told me that the city government alone has more than 5,000 employees, both permanent and contractual. Excluded from that figure are officials and employees of the many barangays in the city. That was several years ago. The city would probably have 6,000 personnel by now. Paranaque is a big city, like the cities of Manila, Makati, Quezon, Cebu, Davao, Baguio, Dagupan, etc. These big cities would have around about 5,000 or more personnel each. If we assume that an average city would have about 2,000 personnel, multiplied by 122 cities, that's around 244,000 personnel. The municipalities. If we assume that an average municipality would have around 1,000 personnel, multiplied by 1,500 nationwide, that's around 1.5 million people. Provinces would have bigger number of personnel than cities. If they would have 2,500 people each on average, multiplied by 80 provinces, that's another 200,000 personnel. The barangays. I think there are at least 20 officials in each barangay (8 elected, at least 7 appointed, like the barangay secretary, treasurer, health officer, tanod head, etc.). Some barangays have more than a hundred employees, to include traffic officers, barangay tanods, brgy office staff, etc. At 20 personnel x 42,000 barangays, that's another 840,000 personnel. These numbers are rough estimates. I will try to find other papers that can give more definitive figures. But assuming that the above estimates are close to their actual numbers, that's a total number of 2.78 million officials and personnel in LGUs alone. Is it advisable to keep expanding this number through the creation of more LGUs, aside from the natural increase of existing LGUs by virtue of natural expansion of the bureaucracy? Excluded from the above estimates are employees of national government agencies (soldiers, teachers, policemen, firemen, social workers, etc.) in the Executive branch. Then there are several hundred thousand more employees from the Judiciary (Supreme Court to lower courts), the Legislature (Senate, Congress, Batasan + district office staff, electoral tribunals), the Constitutional bodies (COA, CSC, COMELEC, CHR, Ombudsman, etc.). Then there are also several thousand personnel in the foreign aid and multilateral government bodies like the UN, WB, ADB, etc. Government, from national down to local government, even not counting those working in the multilaterals, is the biggest employer in the economy. Probably about 12 to 15 percent of the total employed people in the country. Since most functions in government are regulatory in nature, like telling people that they cannot start a bakeshop or barbershop or foodshop, unless they get the signatures and permits first of people from the barangay municipal/city hall to the national agencies like the BIR, SSS, DTI, SEC, etc., it is NOT good to expand government. From the local to national government. That was some pretty big difference.